For two weeks every summer, the town of Williamsport plays host to a the sports phenomenon that's known worldwide as the Little League World Series. The town made its money in lumber in the late 1800s, and today is otherwise unexpectedly small, a mere 30,000 residents. This winter, the action will happen 30-50 miles north of Williamsport, where eight small Pennsylvania towns are preparing to have their post offices taken away from them as part of the Decimated "Expanded Access" Retail Access Optimization Initiative (RAOI). And if you guessed that I'm about to show you all eight post offices in the area, then Yes! ; you know me all too well, and I'm glad you read my blog. Thank you. I reached all these post offices Saturday afternoon, which means they were all closed and I couldn't get any postmarks in person for my collection. But, that also means there weren't cars in front of the offices to obstruct one's view, either. So, things work out as they do. One hopes you can appreciate the scale of the featured region. The post offices in the eastern half of the map are generally few and far between. 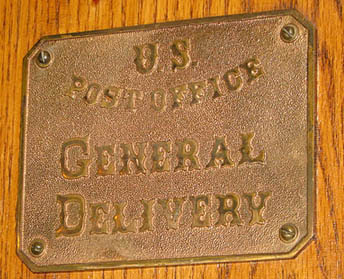 There are a few other post offices not on RAOI and thus not shown: Blossburg; Mansfield; Covington; Liberty; and Canton. Additionally, Troy and Granville Summit are hidden behind the miniaturized map of PA. Still, those likely-to-be-closed offices outnumber those that will remain open over this 380-or-so-square-mile region of the state. I approached Hillsgrove from the south. Boy, was that not fun after a classic Pennsylvania road washout. Multiple sections of the road were reduced to one lane due to parts of the road breaking off and making their way toward the river. One of the perks of Appalachia, which also demonstrates that USPS should tread carefully where it chooses to shutter offices, lest a town become isolated or its commute over to the next town become inordinately painful. In fact, how far away is the next post office from Hillsgrove? Don't believe any numbers USPS shoves at you: It's 12 miles to Shunk. Oh, gee, Shunk's also likely going to get shuttered. But don't worry, Eagles Mere is a mere 17 miles away -- using SAFE roads, that is. It's a measly 12 if you try the mountain roads; the author aborted an attempt to drive over some similar passes about a minute into the climb. So what's the Hillsgrove post office like? It's actually really fantastic: it's in the back of the old general store, behind the fishing rods and near the hunting camouflage outfit department. Here are some pictures! Isn't this a place you would like to save? The big news of the day at the Shunk General Store was that local law enforcement (the county Sheriff?) arrested the burglar who stole gas cans from a few locals' yards. Apparently the guy was caught on camera at one of the properties. Frankly I didn't even realize they had cameras out there. Hunting is big out here, and Baumunk's General Store also has everything you'd need. Not sure about guns -- didn't ask.. but golly, they've got a post office! Can you say "classy"? And "Boy, this place has been here a while! What a shame to not have this around anymore!" Very friendly people there. I bought a couple of items from them. If the Shunk Post Office closes, the next two post offices are Hillsgrove (oops) and Grover (... oops again): both at a distance of about 11-12 miles. Beyond that it's a 25-minute drive to either Canton (north of Grover) or Eagles Mere. It's about four miles to the Canton post office; I'm rather sure this will be closed. Poor Grover. Again, small town, four miles from larger Blossburg. At this, as well as at the rest of the post offices in the story, I didn't meet anybody who could tell me more about anything, so this is all I can present to you, dear Reader. Five miles from the larger Mansfield post office. Okay, this town is cute. It's tucked away within -- I'm guessing grandfathered into -- Pennsylvania's Tioga State Forest. Four miles from the Blossburg post office. Nice name -- I'm guessing it has to do with the river behind it. Traditional architecture, a few establishments nearby. 4.3 miles to Ralston, 6.4 miles to Grover... oops, scratch those. 10 to Canton or 11 to Liberty. My experience at Ralston shows why it's dangerous to just take away a town's communication lifeline: If both Ralston and Roaring Branch is close, the closest post office is 15 miles south in Trout Run. Unfortunately, when I got there at 7 at night, traffic was backed up half a mile on this rural road. Just south of town a car accident had knocked over power lines, taking the whole route out of commission for a substantial stretch of time. Thus, that 15-mile trip toward Trout Run turned into a 33-mile, 53-minute trip, thanks to this blocked artery. If Trout Run's out of commission, Liberty is also a 16-mile drive. Hope you all enjoyed this entry. Believe me, there's a ton more where this came from! P.S. If the distances sound large based on the map presented above, consider that these roads are rural and winding. This makes me think about the route I might take through Pennsylvania to the National Postmark Museum in Ohio next month! Hillsgrove and Shunk are classic! Neither appears to be handicapped accessible, and both with those old style mailboxes. I particularly like how the Hillsgrove mailbox has been updated with a sonic eagle emblem, the 13-ounce rule and the barcoding sticker, but a new coat of paint apparently wasn't in the budget. Haven't seen the barcoding sticker before.